The 136 metre Lürssen superyacht Flying Fox has been captured underway on her maiden journey from the German yard to Stavanger, Norway. 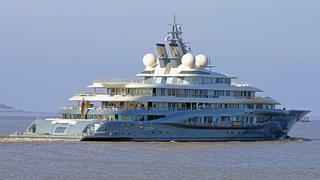 It comes after the yacht, which has now arrived in Norway, departed the German yard on March 6 following her delivery. Previously known as Project Shu, Flying Fox completed her sea trials off the coast of Germany in May 2018. 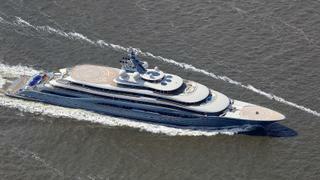 Following delivery, she is now one of the top 20 largest superyachts in the world. With a beam of 20.5 metres, Flying Fox boasts a massive volume. She features a stylish exterior by Espen Øino, with cutaway bulwarks on the bridge deck and upper deck that will allow plenty of natural light to flood in through the floor-to-ceiling windows. The yacht's proportions are well balanced, allowing for expansive exterior decks and more intimate formal areas. A special feature is the enormous swimming pool, which is set transversely on the main deck aft. Flying Fox also has large sea terraces and swim platforms, which enable easy water access for watersport activities. Of particular note is Flying Fox's helicopter capabilities: she has a pair of superyacht helipads, one on the sun deck and a second situated on the bridge deck, with D-Values of 18 metre and 14 metres that are able to host the largest helicopters on the market. "Shu fulfils the requests of a very experienced owner in an exceptional way," says the shipyard's managing partner Peter Lürssen. "The owner's input within all aspects of the yacht's design was clear, strong and exacting." Flying Fox's elegant and graceful interiors are by Mark Berryman. The designer has created a calm and spacious interior highlighted by neutral tones complemented by tactile surfaces and finishes. Imperial Yachts acted as the broker, owner's representative and build supervisor during the build of Flying Fox, as well as operational manager. 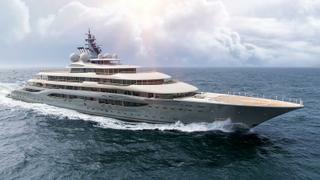 Lürssen has two other projects to be delivered this year; the 111 metre Project Tis and 95 metre Project Fiji.